Habit: Plant 10--50 cm. Leaf: basal blade deeply 3-lobed (> 3/4 to base) to +- palmately compound, lobes lobed, teeth +- sharp-tipped. Inflorescence: flowers 4--14; pedicel 3--7 mm. Flower: hypanthium long-obconic, part fused to ovary > free part; petals 7--16 mm, generally obovate, 3-lobed, white or pink; ovary > 1/2-inferior. Seed: smooth. Chromosomes: 2n=14,21,28,35. 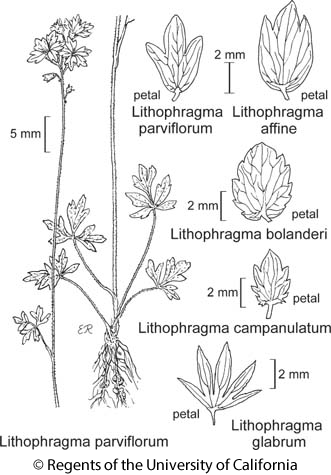 Citation for this treatment: Michael S. Park & Patrick E. Elvander 2012, Lithophragma parviflorum, in Jepson Flora Project (eds.) Jepson eFlora, http://ucjeps.berkeley.edu/eflora/eflora_display.php?tid=31246, accessed on April 22, 2019.